Cherry, Berry and Orange! 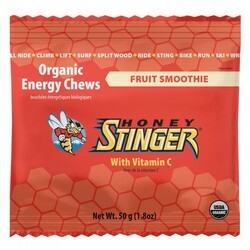 As Honey StingerÍs most popular energy chew flavor, our Fruit Smoothie Blend includes cherry blossom, orange blossom, and mixed berry. A perfect option for those who canÍt decide on just one flavor. Certified organic, certified gluten free, fortified with 100% RDA vitamin C, this is a delicious snack or energy source! Sweetened with organic honey and tapioca syrup, these chews provide a natural and sustainable source of energy with the multiple carbohydrate sources: glucose, fructose, maltose, sucrose.